If you’re interested in the Canadian tech scene, Toronto is on your radar. Certainly the hype surrounding this tech scene is not undeserved. Among other good news to come out of Canada’s financial capital, the city has cemented its reputation as a global center for AI, thanks to a $5 million investment by Google into the Vector Institute last year and an aligned buy-in from the city’s academic, government and corporate sectors. Toronto now boasts the highest concentration of AI startups in the world and has added more new tech jobs in the past year than New York City and the San Francisco Bay Area combined. Add to these merits a myriad of top-notch incubators, accelerators, coworking spaces, and government incentives, and it’s easy to see why a recent survey found that Toronto is expected to break out as one of the world’s leading innovation hubs over the next four years. Of course, Toronto is not without its drawbacks for tech startups. And for those looking to explore and potentially break into the Toronto tech scene, understanding its great promise, and its potential pitfalls, is paramount. Following a team member’s recent trip to Canada’s biggest city, we decided to really delve into what makes this city’s tech ecosystem unique, in both its advantages and disadvantages. Arguably the most important part of any startup ecosystem, networking and support organizations abound in Toronto. Incubators, accelerators, and world-class industry events all provide entrepreneurs access to not only networking but mentorship from those who have been long established on the scene. According to a report by the City of Toronto there are over 60 business incubators in the city, and the growing Toronto tech startup community is seeing a rapid rise in innovative solutions. One of the historically most important organizations that has contributed to this is the MaRS Discovery District, which launched in 2005 as one of the world’s largest innovation hubs, offering funding, mentorship and facilities to the city’s entrepreneurs. Other notable accelerators in the city include the Creative Destruction Lab, Extreme Accelerator, and Highline, each offering highly-sought after programs with mentorship, access to capital and working spaces. There’s also Techstars — a newcomer to the Canadian startup scene — which is holding its first cohort in Toronto this year. The accelerator is led by Sunil Sharma, who was also active in getting the world’s premier pre-seed startup accelerator, The Founder Institute, which was started by Adeo Ressi and Jonathan Greechen, up-and-running in the city. Universities are also contributing to the city’s impressive innovation, with DMZ at Ryerson University, University of Toronto Entrepreneurship, York Entrepreneurship Development Institute, and The Accelerator Centre all being named as some of the world’s top university-linked business incubators and accelerators. There are also a plethora of coworking spaces. For startups looking to test the business environment in Toronto, WeWork is located at the heart of the city’s Entertainment District with six full floors of private offices, coworking space, and meeting rooms in a beautiful 100-year-old building. Workplace One also offers several coworking spaces within the city, located in the districts of King West, King East, Queen West, and Bay Bloor. The diversity of locations allow any startup to get a feel of the lay of the land in Toronto to better understand which district best suits their needs. In Queen West you’ll also find Acme Works, which focuses on the needs of startups and offers flexible working hours along with a sense of community and collaboration. Koreatown is yet another district where startups can find coworking spaces. Catering to the needs of female founders and women in tech, Shecosystem bills itself as a safe, open, flexible coworking space. It offers a home base for women, trans and non-binary people, and allies of all genders who work independently but seek to connect with an engaging community that values holistic wellbeing. For a more detailed list of coworking spaces by district in Toronto, there are 20 named on blogTO. If you are looking for more detailed information, including a full list of investors, VCs, and other resources, you can check out the Founder Institute’s Toronto Startup Ecosystem Canvas. As far as events go, Toronto is home to some of the biggest in AI, blockchain, and SaaS. In June the city holds the largest AI event in Canada, AI Toronto, with two days full of education, networking and product demos. As the birthplace of Ethereum, the city also held the inaugural Blockchain Futurist Conference in August, which featured speakers such as CNN legend Larry King, the co-founders of Ethereum, and the CEO of Dash. 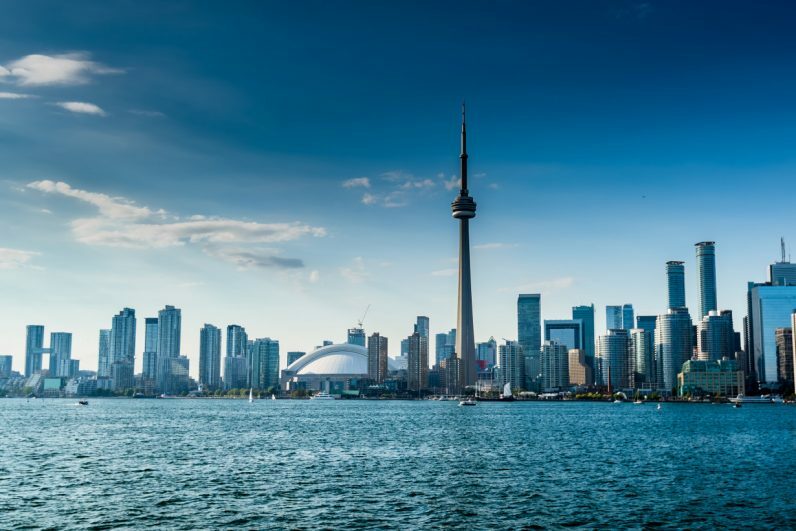 And starting next year, the world’s biggest SaaS conference, SaaS Monster, will move its headquarters to Toronto, connecting more than 5,000 CIOs and CTOs, buyers and sellers, and established companies in the city. But not all of the city’s events are so massive. For smaller, more intimate events, Startup Grind, Techstars, TechTO, DevTO, and CoFoundersLab all provide regular meetups for entrepreneurs to gather and discuss ways and means of growing their startups in Toronto. There are plenty more organizations holding smaller events to get acquainted with after settling down in the ecosystem, too. According to the Global Startup Ecosystem Report and Ranking 2017, Toronto moved up on place and is now number 16 in the rankings. Said Salim Teja, Executive Vice President of Ventures at MaRS Discovery District, on The Next Web, “The Canadian venture capital community has grown substantially and savvy international investors are recognizing that Toronto is an under-tapped market for technology, in fields including AI, fintech and health”. Interestingly, a major portion of the tech talent in the Greater Toronto Area — which has a population of nearly six million — actually comes from outside of Canada. While Toronto’s educational facilities are highly regarded, many students working in STEM fields are poached to join big firms outside the country, lured to places like Silicon Valley with promises of higher salaries and quick advancement. This has led to a tech talent demand that has incentivized many immigrants to flock to the country — and Toronto in particular. In fact, one survey found that of 100 high-growth Toronto-region tech firms surveyed, 53 percent saw the number of international job applicants increase from 2016 to 2017, with some even experiencing a doubling or tripling of interest from foreign candidates. If immigration trends continue, the government estimates that Toronto would be welcoming nearly 170,000 immigrants over the next couple of years. And thanks to Canada’s skilled immigration policy, 22,500 new jobs have already been added in Toronto alone. Startups looking to move to Toronto will therefore encounter a skilled, eager labor force made up of both immigrants and homegrown talent. With more and more studies enumerating the benefits of working together with people from different backgrounds – with some even arguing that such diversity can actually produce better software – the city’s diversity may prove a big advantage. Canada’s government has prioritized assisting foreign businesses looking to relocate to Canada, and Toronto is a top destination. If accepted, the Canadian government will immigrate the startup’s CEO, along with five founding team members and their families. Though the processing time can be as lengthy as 20 weeks or more, once a foreign startup is established in Canada they are then eligible for grants, loans, funding, and tax refunds and credits in categories such as R&D, film, media, computer animation and special effects, interactive digital media, and multi-media productions. Companies can also take advantage of government incentives such as the Strategic Innovation Fund, which provides funding of $1.26 billion over five years for large-scale ($10M+) industrial and technology projects via repayable and non-repayable contributions. Also available is the Clean Growth Hub, offering over $2.3 billion-worth of personalized services and programs to support the growth of clean technology in Canada. Other perks for startups come in the form of wage subsidies and assistance programs, which are particularly aimed at Canada’s employable youth. For example, the Canada Summer Jobs subsidy helps small businesses by paying up to 50 percent of the salary to an eligible full-time student. The Apprenticeship Job Creation Tax Credit allows employers to claim up to $2,000 per year for each eligible apprentice, while the Canada Job Grant helps employers train new or existing employees for jobs. A final advantage worth noting is the presence of corporate giants such as Samsung, Uber, and General Motors, who have all recently set up research hubs and offices in the city. This opens up the possibility of collaboration with startups, as entrepreneurs can benefit from the resources of large enterprises, and big corporations can leverage the agility and innovation of startups in win-win partnerships. Locally, FedDev Ontario helps startups by investing in business innovation, and Enterprise Toronto provides assistance with starting and growing small businesses. Ontario Centres of Excellence (OCE) also connects entrepreneurs, startups, industry, academia & investors to commercialize innovation. In any case, we’d be remiss not to mention Toronto’s potential drawbacks. For small businesses finding new customers is always a worry, and being headquartered in Toronto doesn’t offer them much of a leg up in this regard. The Future of Business survey highlights attracting new customers, increasing revenue, and maintaining profitability as the major worries of small businesses not just in Toronto, but in Canada as a whole. And for entrepreneurs looking to move their families to Toronto, the city is facing what the Financial Post calls “a housing supply problem.” Due to bureaucratic red tape, multi-family housing projects can now take more than three years to complete, which is double what it was 15 years ago. For this reason, 42 percent of young professionals actually consider leaving Toronto due to a lack of affordable housing — a challenge shared by many other tech hubs, including nearby New York City and, of course, the San Francisco Bay Area. Even still, despite the drawbacks, the incentives for startups to move their businesses to Toronto are many. It’s a hotbed for artificial intelligence, blockchain, and SaaS innovation. Startups such as Upchain, a business founded by John Laslavic that has raised $7.4M, and Optimity, led by Jane Wang, are examples of this. Meanwhile, the government is providing numerous subsidies to help small businesses and the the number of support systems available to entrepreneurs keeps growing. In other words, pros and cons should be weighed, but there are good reasons for why Toronto’s making headlines.